← Do You Know Your Musical ABCs? 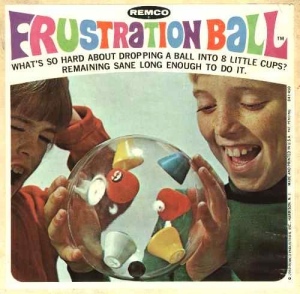 In 1969, I got this toy for Christmas called “Frustration Ball”. The toy consisted of a clear globe with eight cups and one ball. The object was to toss the ball from one cup to another in order, without missing a cup. For instance, you started with the ball in Cup 1 and turn the ball enough for the ball to be captured in Cup 2. You continued this routine until you achieved getting the ball in all eight cups without missing one cup. If you missed a cup, you started all over again. Thus, the term “Frustration Ball”. How does this relate to banjo, mandolin and guitar? The idea is best exemplified when practicing a scale, riff, or song. When you practice, pay careful attention to the details. Pick one note at a time and listen to what you are playing. Practice slowly and don’t double hit your notes. Most importantly, if you make a mistake, start over and try again. Do not play over your mistakes without correcting them first. With persistence and dedication, the results might surprise you. We have all experienced the frustration of practicing and struggling to get a certain song perfected. Imagine, as a 9-year old, how I felt when I finally reached all eight cups in a row without making a mistake. Its the same feeling I get now when playing a song accurately. 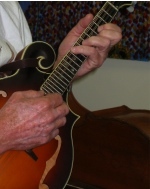 This entry was posted in Music Technique and tagged Practicing Music. Bookmark the permalink. 11 Responses to Is Practicing Music Frustrating? My frustration with practicing comes when I try to apply what I’ve “learned” in my lesson at home and I realize that I’ve forgotten everything…..Aghhhhhh!!!! and I pay attention to what my instructor tells me….but it just doens’t stick until I’ve heard it a bizillion times! I have very recent memory of the frustration of practicing, since I just finished practicing. During this session, I was practicing a song over and over and not getting it right over and over. I tried going over the part I was having difficulty with, just a measure or two before and a measure after and I did that correctly, but then I had a lot of trouble fitting that part back into the whole song. I just could not seem to get the whole song together. So, I decided to move on and come back to it later. Then, when my practice was practically over, I decided to play along with the recorded version. And, you know, I did a lot better. Just stopping and doing something else for a while and then listening to the song a couple of times on the CD and playing along made a lot of difference. My frustration will no doubt return at my next practice, but this was a good experience. Productive practice is really difficult but you have to enjoy the process. I’m still working on it. Sometimes you can only get so far in one session. The expression “sleeping on it” is an important concept since learning really does require that nights sleep. That’s why cramming for exams at the last minute never worked. Good teach; covers a lot of areas of interest(practicing concerns). One point which applies to me is I’ve often in my practice kept the technique of “keep going if you make a mistake”. That only applies if you know what you’re doing. First you have to ‘get it right’. Doubt must first be overcome; then make sure you’re practicing the notes correctly. It’s very important to know the whats and whys of ones’ practice sessions. Not repeating a “wrong note” or “bad technique” is scrucial to learning. Personnaly, I’ve never practiced scales so I am taking on the advice of the teacher and practicing scales! …didn’t make much sence at first but, later while practicing a song a riff came out of nowhere and it was because I’d been practicing a scale in that key for days. The gratificacion of practicing that scale came to me while practicing something else days later!. And that’s what motivates me now when practicing something. I first began. I like this article, pass me another cup. I’m currently practicing the chord progression for Arkansas Traveler. It’s a tough one for me, 2 chord changes per measure in much of the song. I set my metronome for a 50 beat 1/4 note tempo, and it’s amazing the progress that can be made by not playing over a mistake. I was even counting missed beats as mistakes, if i didn’t get that bass note on the flash of th LED on the met, i started over. If i tripped on a chord, start over. After 30 minutes of doing this, i could see progress thru 1 measure, then 2, at first i couldn’t really hear the rhythm of the song, then when i got to the point where i could accurately play thru 4 measures, i could hear the rhythm of the song. It takes alot of discipline to practice this way, especially at the super slow speed. But i really want to learn this tune accurately, i believe it is one of the most challenging ones Fretmentor teaches. This reminds me of a game at our local arcade called Spark Challenge. The way it works is you control two prongs that sit above and below a revolving metal track that spirals to the top. If the prongs hit the track even one time, you lose. As you get closer to the top, it looks almost impossible, and for a while there I thought it was one of those carnival-type games that really is impossible, but with practice I finally beat it (you get 4000 tickets when you win). It really is a great metaphor for practicing trouble passages. Far too often, I think, we instrumentalists suffer imperfections in our playing, and it shows in our performances and, ironically, in our enjoyment of the instrument. Like your experience with the frustration ball, when I successfully completed spark challenge I was exhilarated. The same is true when I nail a difficult run on violin, but so often I rob myself of that joy in orchestral work by fudging it since it’s just going to sound like a glissando anyway. Mercy is a great thing, but when applied to practice, it is debilitating. Harsh taskmasters make better and happier musicians. I find that when practicing using tablature, I can eventually memorize the tab, timing and special licks including slides, pull-offs, etc……..but the playing becomes so mechanical I have no bounce (or “shuffle” as Earl refers to it, p.62 of his newest book) or other feel to the music…..boring. Worst of all, when I play with the performance group and I miss a note or lick during my break, I lose my place and have a very difficult time recovering…train wreck city! I can avoid these problems when I sit and listen to a song and get the melody line firmly in my mind, then learn to play the song by ear. (I now know why Earl says he’s played Foggy Mountain Breakdown a million times but never the same way!). My biggest problem with this technique though is slowing the song way down to fit the group performance…..my brain’s ability to then synchronize the tune as played slowly with my brain’s expectations at the learned tempo is very difficult to do without losing my train of thought which causes me to foget the song. Very difficult to describe. Ant help out there? Still trying to figure out the relationships among chords as I move up the fretboard. At the end of a lesson I think I’ve had an “Ah ha” moment, only to have it slip away on the first day pf practice. As Ewu mentioned to us at the workshop, if you play a song 2000 times, then you will have perfected it, and practice very slowly. Songs I don’t mind but scales put me to sleep. I have been having a tough time trying to remember the lead and chords for “Arkansas Traveler”. That is really a tough one, but after playing it a hundred times or more, I am just beginning to get the first part of it. I find the chords next to impossible, 34 changes in 19 measures. Practice, practice, practice.